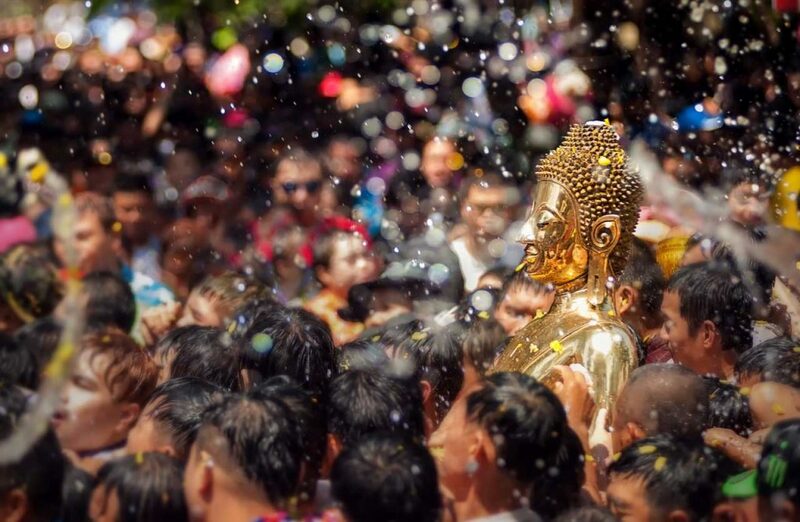 Wherever you go in Thailand, you’ll find that as soon as the sun goes down – and sometimes before – the streets fill up with tables and chairs, the fragrant air cools and thickens with cooking smoke and every available space on the pavements becomes a makeshift restaurant. Thai street food is at the centre of a culinary culture that embodies the country itself – lively, communal and exotic, with plenty of surprises in store. Keep an eye out for these street staples when you’re on the streets of Thailand. 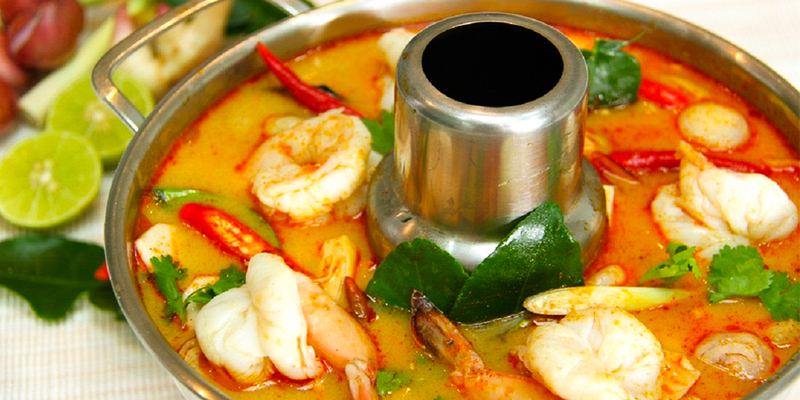 If one dish could conjure up the quintessential aroma of Thailand, surely it’s Tom Yum Goong. This Thai classic is a lively blend of fragrant lemongrass, chilli, galangal, lime leaves, shallots, lime juice and spicy fish sauce, all simmering together in a bowl that’s bursting with flavours. Succulent seafood and straw mushrooms lend it body and a little extra bite. Tom Yum is probably the best place to start with Thai cuisine, as it gives you a signature flavour of the country; over the course of your travels through Thailand and your wanderings through its culinary landscape, you’ll find you keep coming back to this classic dish. 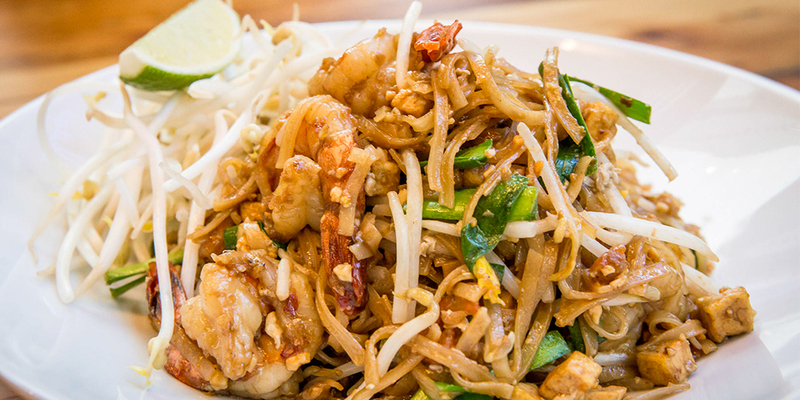 Pad Thai is a street food staple that simply has to be tried if you’re heading to Thailand. Cheap, simple, ubiquitous and delicious, this is a quick and easy option that never fails to deliver. Pad Thai is made from your choice of noodles, tossed into a wok alongside crunchy beansprouts, onion and egg, then brought to life with a range of sauces and spice. Take your taste buds to the next level with a combination of condiments including fish sauce, sugar, chili powder and finely ground peanuts. Another signature dish that should take pride of place on your culinary bucket list is Gaeng Daeng – also known simply as red curry. This rich, aromatic curry combines fresh flavours with a warm kick of spice, made with tasty morsels of chicken marinated in red curry paste, bathed in smooth coconut milk and topped off with a sprinkling of fresh and fragrant kaffir lime leaves. Colourful, creamy and with a sting of chili in its tail, Gaeng Daeng is a taste sensation for lovers of spice. 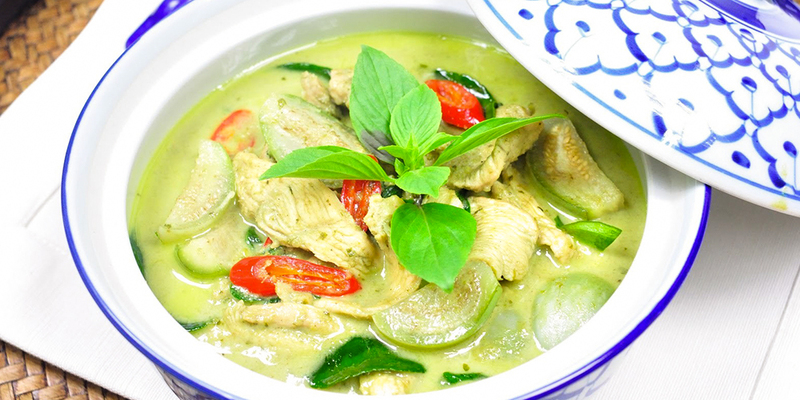 If you want to dial down the heat, without losing any of the punch in the curry flavours, then Thai Green Curry is for you. Generous dollops of green curry paste are blended with strips of tender chicken, bamboo shoots and sprigs of coriander with sweet and aromatic basil. Bathed in lavish helpings of coconut milk, Gaeng Keow Wan Kai is mild, flavourful and irresistibly moreish. 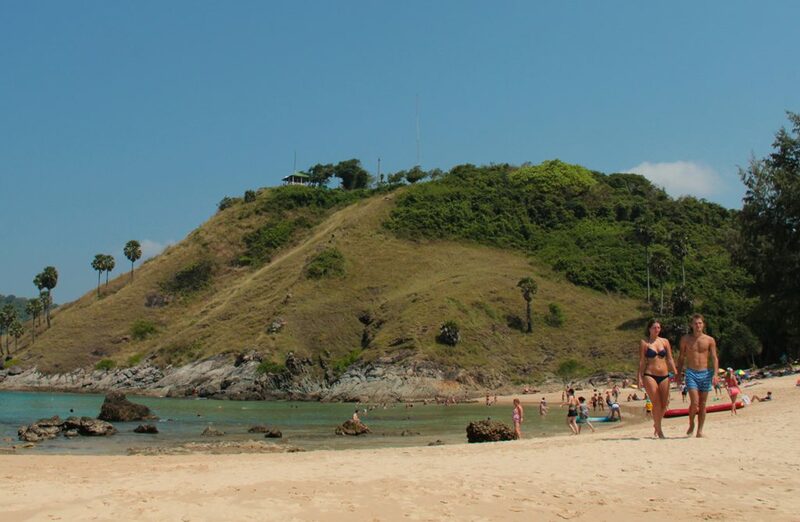 Served up with a bowl of fragrant rice, this internationally renowned Thai classic tastes even better in its homeland. 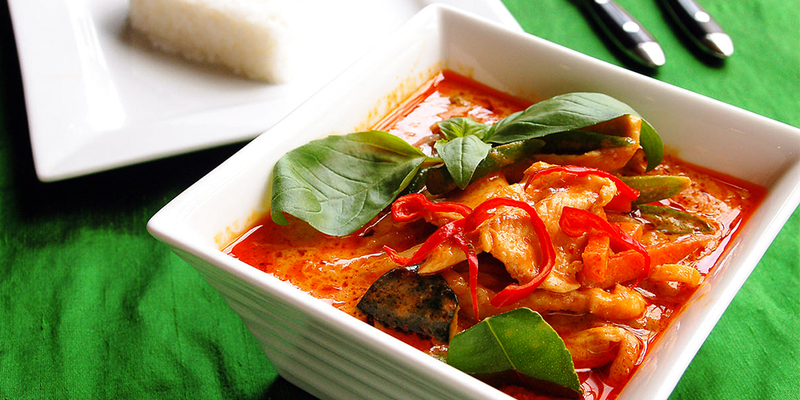 Thai curries come in a range of shapes and sizes, in virtually all the colours of the rainbow. Massaman is the foreign lodger in this bustling house of spice, incorporating noticeably Persian influences and ingredients. 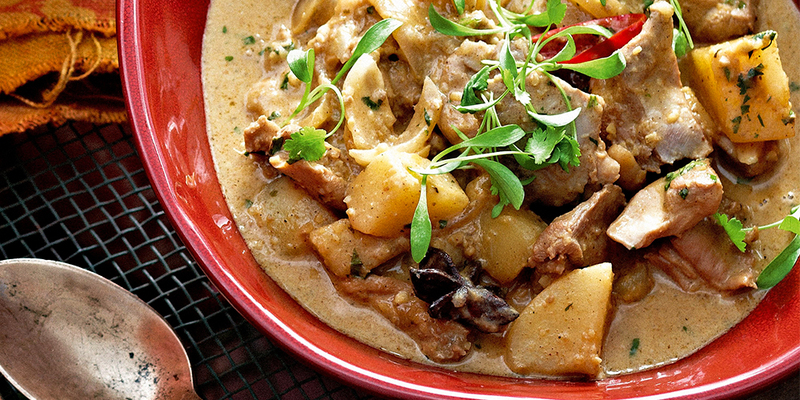 Like its neighbours, Massaman is made around a familiar base of coconut milk, alongside chicken and potatoes. An extra flourish is added with roasted peanuts, cinnamon, bay leaves, tamarind sauce, and usually a decadent dash of sugar. This is a great option for foodies who like their curries mild; for veggies, you can also substitute chicken for some delicious local tofu. 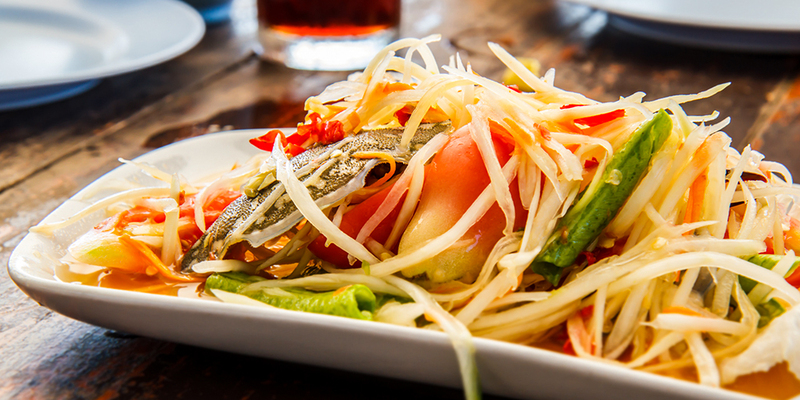 Som Tum Thai is a succulent and crunchy raw Thai salad that’s commonly made with shredded unripe papaya, sliced tomatoes, raw beans, peanuts, dried mini shrimp and fresh garlic. Grated carrots and green or purple cabbage add to the colourful kaleidoscope of ingredients. Add to that a sweet, salty and tangy sauce made of sugar, lime juice and fish sauce, and you have an eye-popping feast that’s both fresh and fulfilling. This is simplicity itself; street vendors fry up some minced port in a wok with a little soy sauce, then toss in some basil and chuck a fried egg on top for a quick and easy street staple that always hits the spit. Savory, spicy, salty and irresistible; just the ticket if you’re feeling a bit worse for wear following a big night out in Bangkok. 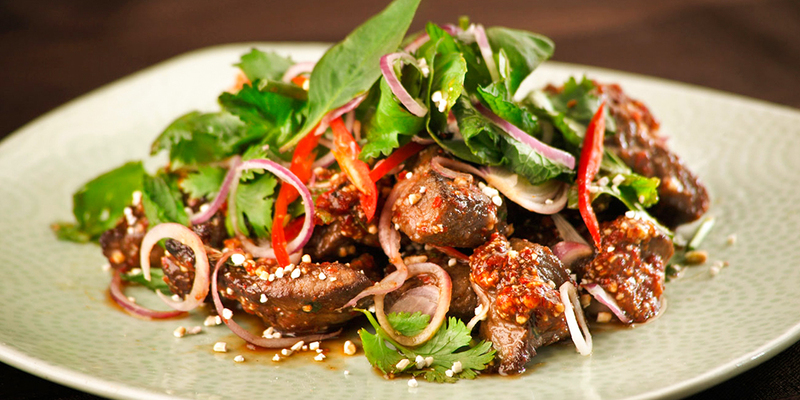 A sprightly mix of onion, coriander, spearmint, lime, dried chili and strips of beef, Yam Nua draws together all the vibrant and tongue-tingling taste sensations of Thai street kitchens into one dish. 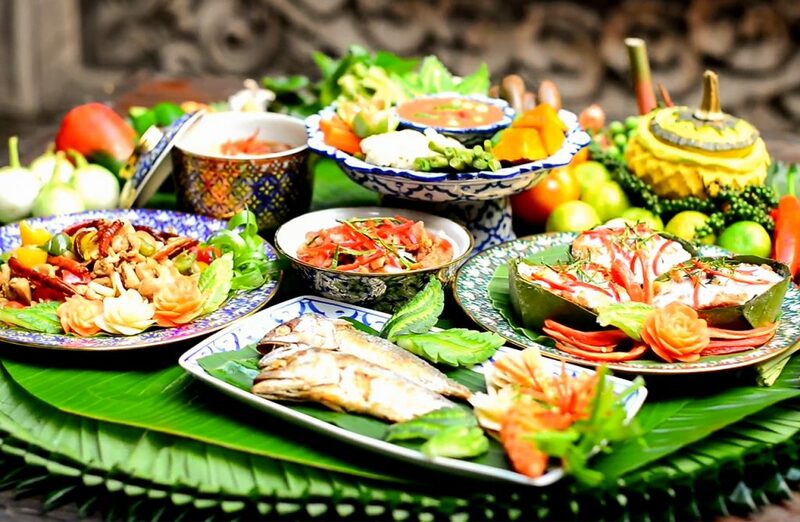 Sometimes served up with cucumber, avocado or cherry tomatoes, garnished with sprigs of basil and beansprouts, Yam Nua takes you on a tour of all the major food groups and packs a punch of flavours that is so typically Thailand. Simple yet sumptuous, Kai Med Ma Muang is a travellers’ favourite that you’re guaranteed to enjoy. 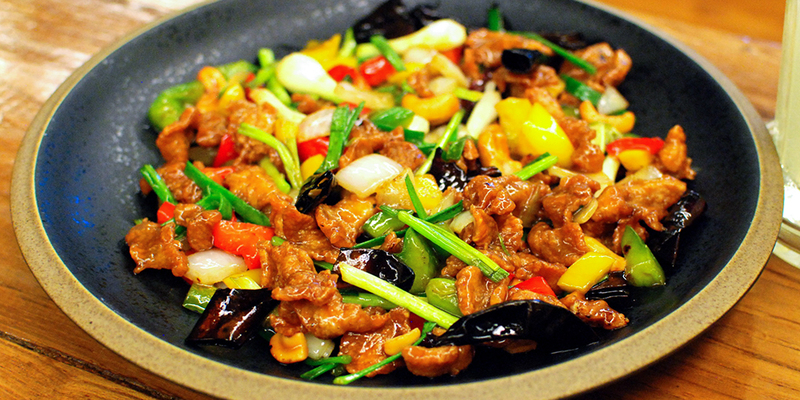 Shimmering chunks of fried chicken, marinated in honey and apple sit alongside roasted cashews, sweet soy sauce, onions, chilies, pepper, carrot and mushrooms. Satisfying and sweet, this fresh and colourful ensemble of ingredients isn’t too spicy, but infused with enough flavours to leave you licking your lips and asking for second helpings. 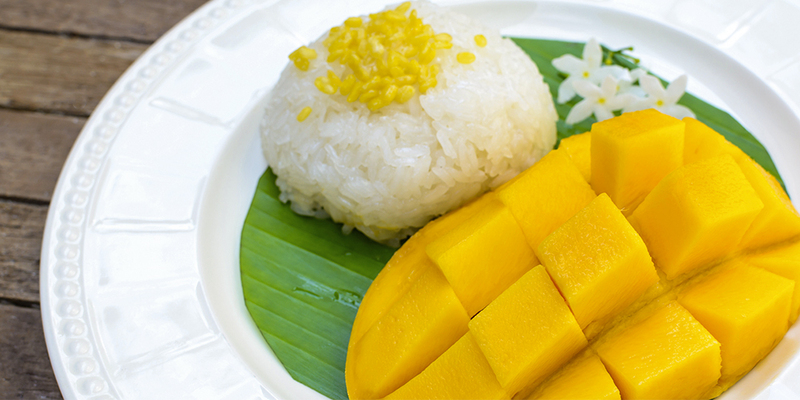 The perfect end to all this savory, sour and spicy fare is the heavenly sweet combination of mango and sticky rice. 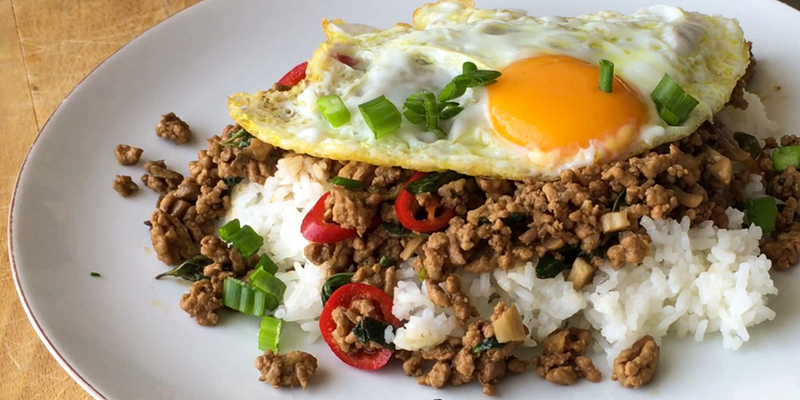 Kao Niew Ma Muang is another simple staple that always fits the bill. Made with sticky rice, fresh mango slices and coconut cream syrup, this is the perfect end to a perfect meal. The sticky rice absorbs the coconut cream, creating a plump and soft texture with a mildly sweet taste. The dish is particularly popular when mangos are in season from April to May, but you’ll see this little yellow plate of sunshine brightening up tables and stalls throughout Thailand all year round.